New president Akio Toyoda outlines his vision for the company's future in his first interview with an American publication in his new role. As Toyota's leadership changes hands amid economic woes, here's a look at some of the Japanese carmaker's best-selling and most memorable vehicles over the years. (Fortune Magazine) -- Even though he has the same last name as five of the 10 previous presidents of Toyota Motor, Akio Toyoda is nothing like his predecessors. Item: He has spent seven years in the U.S., holds an MBA, and speaks flawless English. Item: He likes to race cars and just completed a 24-hour endurance competition with three other team members in a Toyota supercar at Germany's famed N�rburgring. Item: At age 53 he is 14 years younger than the man he is succeeding, and he believes that his relative youth "can make a unique contribution" to the company. Toyoda takes office two months after Toyota (TM) reported the biggest annual loss in its history -- $4.4 billion. He thinks that his family's company -- at last count, the Toyoda clan owned approximately 2% of the stock -- suffered because of a "once-in-a-century crisis" brought on by the global economic slowdown, as well as Toyota's own internal problems, some of them at its U.S. operations. He vows to rein in overcapacity, reorganize operations to strengthen control, and get the company back to basics. He especially wants to reinstill dedication to one of the pillars of Toyota's production system: genchi genbutsu, meaning "go and see for yourself." Akio Toyoda is a grandson of Toyota's founder, Kiichiro Toyoda (the family changed the spelling of the company's name for greater euphony) and the son of Shoichiro Toyoda, now honorary chairman. After getting a law degree from prestigious Keio University, he went to the U.S., where he received an MBA from Babson College (the alma mater of another auto scion, Edsel Ford II). He joined Toyota in 1984 and returned to the U.S. for a two-year stint as head of NUMMI, the California plant that is a joint venture with General Motors (GMGMQ). At ultraconservative Toyota, Toyoda is considered a bit of a radical. In the early part of this decade he headed the development team for an Internet venture, Gazoo.com, which provides information on new and used vehicles and which morphed into a lifestyle cybermall. If Toyoda is fazed by the challenges awaiting him, he didn't betray it during an hourlong interview at the Four Seasons Hotel in Washington, D.C., his first with an American news organization in his new role. Instead of traditionally bland Japanese business attire, he wore a blue tattersall shirt, red-patterned tie, and black loafers. On his left wrist was what he described as his lucky charm, a bracelet with his birthstone inset. Toyoda took questions from Fortune's Alex Taylor III in English and answered, in traditional Toyota fashion, in Japanese through a translator, circumspectly. Fortune: Toyota presidents typically worry about the company growing so large and bureaucratic that it becomes infected with "big company" disease. Has that happened yet? Toyoda: The company is a little bit infected. But if we look at our company as three 3-million-car companies rather than one huge company of 10 million cars, I believe we will be able to figure out ways to avoid being infected. A lot of conditions and situations are different, so we need to develop cars best fit for the conditions in each region: Japan, the U.S., and Europe. Toyota has been very successful, but it is perceived as stuffy and conservative. Do you intend to change that? Well, we do not want to be too light, but we have to be stable and step fast. I believe I can make a unique contribution because I am a young president by Japanese standards. The age difference between myself and associates in my company is smaller. Has Toyota responded quickly enough to the economic downturn, and should it be doing more? We may have to slightly change some of the ways of doing business, depending on the changes of the market. Some of the good things we did, and also not-so-good things we did, may not completely fit the situation. So while preserving our good DNA, I would like to have the courage to change some things if those things have to be changed. Our philosophy of "Customer first" has to be stronger. Several of your competitors have been speeding development of electric cars. Does Toyota need to do more? Electric cars' battery life is limited, and that has not been solved. We would like to utilize our hybrid technology because we have accumulated quite a bit of knowledge about battery usage for hybrid cars. Depending on how electric cars are used or how they are found to be valuable, for the time being Toyota would like to focus on hybrid technology. Your new hybrid Prius became the bestselling car in Japan after you priced it aggressively against the hybrid Honda Insight. Why are you pushing it so hard? We have a desire to popularize hybrid cars so that more people can enjoy them. And under current market situations, we would like to be able to produce more hybrid cars. That would make us happy. How long do you think the sales downturn will last? There are 250 million cars in the U.S. The industry is selling 10 million units a year, which means the market turns over every 25 years. I believe 25 years is too long, and we should make efforts so that a 10-year cycle is more appropriate. The current market size of 10 million is too small and too unusual. It may not go back to 16 million, but I believe it will recover to 12 million or 13 million. Has Toyota been growing too quickly in North America? 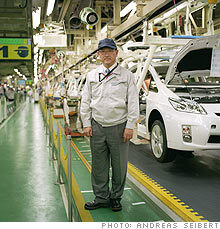 Toyota had a strong desire to become a U.S. car company. I believe that decision was correct, and we will try to strengthen even more. Of course, looking at the current situation, I would say our production capacity may be a little bit too much. Today individual functions in North America, like manufacturing and sales, report back to Japan. Do you plan to change that? In the U.S. we have a 3-million-car company, and there may not be only one person who heads the entire operation. But we would like to make sure the U.S. can complete its own operation and become a fresh American company for its own sake. What do you think is the future of the Detroit Three? GM has been in a leadership position for many years, and we learned many things from GM and the Big Three. We hope the auto industry in the U.S. will grow and continue to be healthy and prosperous. The auto industry is crucial, and it takes up a very big portion of the economy. Is government aid appropriate under these circumstances? I don't have too much information, so I am not in the position of making any specific comments on that point. What is your outlook for sales in Japan, where the population has been shrinking? The Japanese government launched some incentive programs for cars more than 13 years old. If owners buy so-called eco-cars, such as hybrids, the buyers get scrappage incentives. Ever since the Japanese launched this incentive system, cars sold very quickly. But concerning capacity, we need to downsize a little bit, and right-size. Who do you most worry about as a future threat, Korea or China? China has been catching up with very great speed. I believe that it will come close to us very quickly, and from there on we will engage in very severe competition with it. You have had a number of jobs at Toyota. Which one was your favorite? Rather than being in a supervisory position, sitting in an office, I most enjoyed it when I went out and worked with the factory guys on the assembly floor, when I implemented kaizen [continuous improvement] ideas and worked together with the front-line workers to implement them. That gave me the most gratitude and helped me the most in my career. You lived for seven years in the U.S. What were the biggest differences for you between America and Japan? Language [laughs]. Also, Japan is small, and many people live in small areas in the country. So we always have to pay attention to other people, and you always kind of have to consider others. In a way, you get tired of paying attention to others. The U.S. tends to have a higher degree of freedom. You can do whatever you like in a way. But in Japan you have to always consider various conditions and circumstances of others. In this circumstance, of course, I am kind of nervous and not feeling too free ... [laughs]. What product trends do you see developing in the auto industry in the next five or 10 years? We are talking about a once-in-a-century transformation of the market. I believe the auto industry is now trying to face the challenges of presenting a solution to this once-in-a-century change. And what is clear to me is that what is going to happen will not just simply be an extension of the past. Last year was the 100th anniversary of the invention of the Ford Model T and the 100th anniversary of GM. I don't believe this was an accident. Industrial revolutions were experienced for 100 years as the position of workers improved so that they became able to buy cars. However, these conditions that supported the prosperity of the auto industry started to disintegrate. I believe it is an important time for Toyota to present some answers for the coming 100 years. It is Toyota's mission to find out how we can utilize available energy resources and technology for the future. Can the UAW survive in its new role?